OFF THE NEEDLES AND I CAN’T WAIT FOR FO FRIDAY!!! I’m calling this bag Infatuated bacause…I’m infatuated! Felting is finished and it’s sunbathing dry. It has a lot of fuzz, but I expect that will diminish with some patient lint brushing. Hurray! I Have A FO Today! Liesl is a done deal – knitted, ends woven in and blocked. It fits and I’m really, really excited at how it turned out. I’m linking with Tami and Frontier Dreams KCCO today. I’m coming right along with the Cable and Pleat Tunic, being really close to finishing the front and side shaping. For once, the color in the photo is nearly, if not completely, true. Another awesome thing about the patio – it’s a fantastic place for taking pictures. 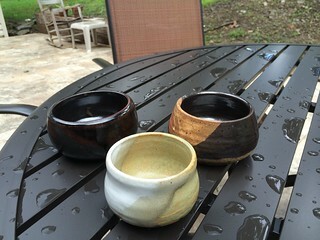 Here’s my latest set of pots, which once again exceeded my glazing expectations. 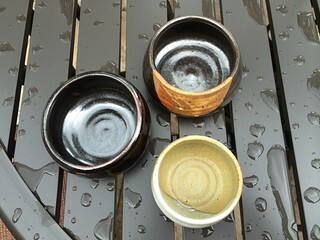 I have one or two left to glaze and plan to go into the studio this weekend to finish them up. Class has a two week break before the next session and it’s always nice to go into the studio with a clean slate as far as projects go. This week’s book is a biography of Johnny Cash by Robert Hilburn. I like it, I don’t love it. It had parts that are hard to read, it feels like you are in the front row for his self destruction at times. It also goes into minute detail seemingly sbout everything, which bogs me down sometimes. This probably won’t be a repeater, it’s a library book, so I don’t feel guilty about just skimming it in parts. I’m anxiously waiting for my Audible credits to show up so that I can get Stephen King’s newest, Mr. Mercedes. They should be coming any time now. Mr. iknead figured out how to turn the autocorrect off, but now, I get aggravated at all the typos and have to proofread much more carefully. I know, gripe, gripe, gripe. Sheesh! I’m linking with the Wednesday regulars, Tami, Frontier Dreams and Ginny. My Cable and Pleat Tunic is once again on the needles, after starting and then frogging three times. I’m hoping that this attempt is THE one and I’ll finally see real progress. Yeah, I can see that outlining them is going to be a must to delineate the paisley shapes. I just finished Maeve Binchy’s A Week in Winter yesterday and it was OK. I enjoyed it, but probably won’t pick it up to read again. Admittedly, it was a departure for me, I generally go for nonfiction or horror or crime novels. Still, I liked it enough to finish it. This morning was the first time I’ve been able to enjoy my coffee and newspaper on the patio. Birdsong and cool breezes, coffee and newspaper=perfect place to spend the morning. Crazy good. Linking with Tami, Ginny and Frontier Dreams today. I received the yarn for my My Harmonica Shrug yesterday, but in spite of my best intentions, it didn’t get finished. Today is another day, though, it could transform from WIP into a FO; technically, the day’s not over until midnight, right? I frogged the Cable and Pleat Tunic and restarted this time without the twist. That’s what distracted me from My Harmonica. I promised Harmonica that I absolutely, positively will not work on any other project until it’s finished. Yes, I talk to my knitting all the time, most of the time nicely, but there have been moments…. The good news is that the patio is finished and we’ve purchased a table, an umbrella and four great chairs to go with it. We’ve also gotten most of the plants in the ground and so far, they all seem to be doing well. We have a couple of different begonias, impatiens, lamb’s ear, butterfly bush and coral bells in the flower bed, with just a couple more to plant, a redbud that a friend gave me and an oakleaf hydrangea from another friend. The bad news is that it has rained for the last three days, so all the lovely furniture we’re so anxious to use is sitting in the garage, waiting for the sun to come out. When I checked the forecast this morning, it said rain and thunder showers continuing through Sunday. Crap. I hope it’s wrong. The other bad news is that Mr. Iknead’s back went out yesterday, due, I’m sure, to all the stooping, squatting and lifting he’s done over the past week or so. He had a rough afternoon yesterday, I hope he’s better today. Poor thing. The newest Yarnbox arrived earlier in the week and here’s what it contained – Two skeins of Fingerpaints Supersock Self Striping from Cherry Tree Hill Yarn, 100% superwash merino, in Java Jive. I have only three words – It. Feels. Amazing. Now, I’m off to stalk Rav in an effort to decide which project(s) to knit next, maybe a shawl or more socks. You can never have too many of either, you know. The Papoose, who claims, as always, “No nap for me, I’m not even tired” as she keeps an eye on the clock for the end of her rest time. Linking with Tami and Frontier Dreams KCCO.